Being Retro: TELL ME TUESDAY: What did they say? TELL ME TUESDAY: What did they say? Come on it's easy... just make a comment, you are entered!! 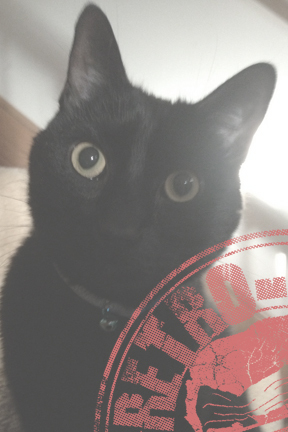 "I refuse to enter any giveaways, zombie kitty!" Yeah, way too early in the morning for something intelligent. At least you get to bring out kitty now. "Oh my God! The McRib is back!" "Rick was right. I should have stayed at the prison with him." "Hello! 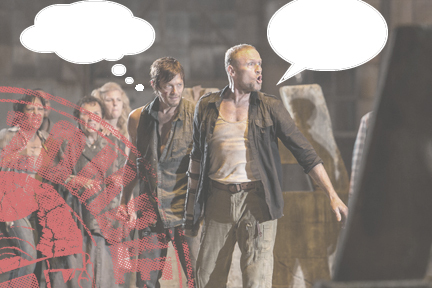 I have never seen a zombie hooter"
"And her booby just fell off..."
Daryl: Tell 'em we want our own zombie on a leash. Merl: Yeah. We want our own zombie on a leash! If not, I'll stab your a...with my knife-hand! You make tshirts, right? And do you make bookmarkers, too? Because I'm a total techno-tard. Please let me know. I don't have a funny, but did enjoy the comments. On my signal we're going to rush them. "This neighborhood gets worse everyday..."
"Who ordered the anchovy pizza?" The kitty made me do it! I am in Need of a Vacation! O is for O'yeah!... Twice, Maybe Three Times! I am ASHAMED, really ASHAMED! I Need Minions for a April's A to Z Challenge? SPOILER ALERT!!!... Or Is It? Man Parts and Lady Parts? So the END is Going to be Beautiful!! You Sure Look Good To Me... Well You Are!